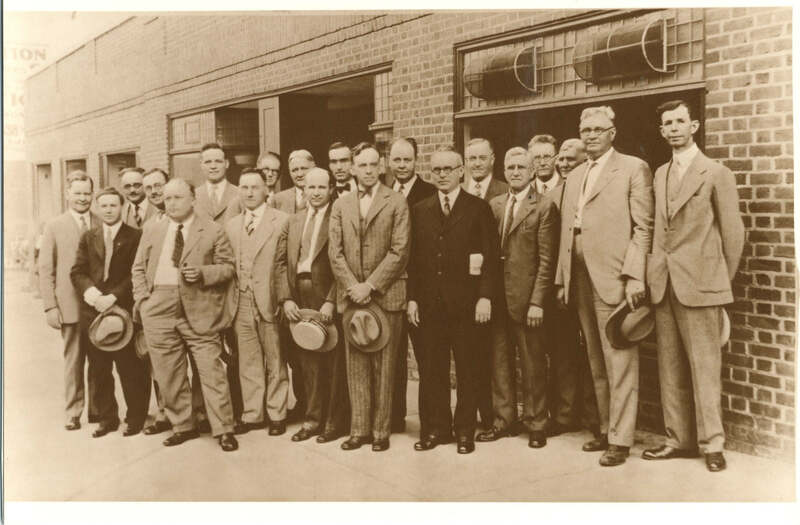 Fifty Two members of the National Piano Manufacturers Association of America formed the National Association of Piano Dealers of America. The first annual meeting of the National Piano Travelers Association was held at The NAMM Show. The oldest known photograph of our membership was taken this year. NAMM helped established the Fair Freight Rates for use in many New York conventions. NAMM published a booklet titled Care of Pianos and was given free to each new member, our first member benefit besides entrance to the show. During the NAMM Show in San Francisco, Charlie Chaplin put on a skit demonstrating proper piano sales techniques. NAMM published a booklet entitled “Music in the Home” to promote private music lessons. NAMM’s main focus became music education and fair trade in the late teens. Thomas Edison was a NAMM member and exhibited at least one of those years. NAMM provided trade shows throughout World War I.
NAPDA was renamed to the National Association of Music Merchants (NAMM). Women are allowed to attend the closing evening NAMM Show banquet as a guest. The National Piano Travelers Association (NPTA) annual meeting at The NAMM Show. The NPTA still meets at the show, making it one of our oldest traditions! NAMM teams with the Bureau for the Advancement of Music and created materials for dealers to display in their stores. NAMM membership hits a new high: 784. 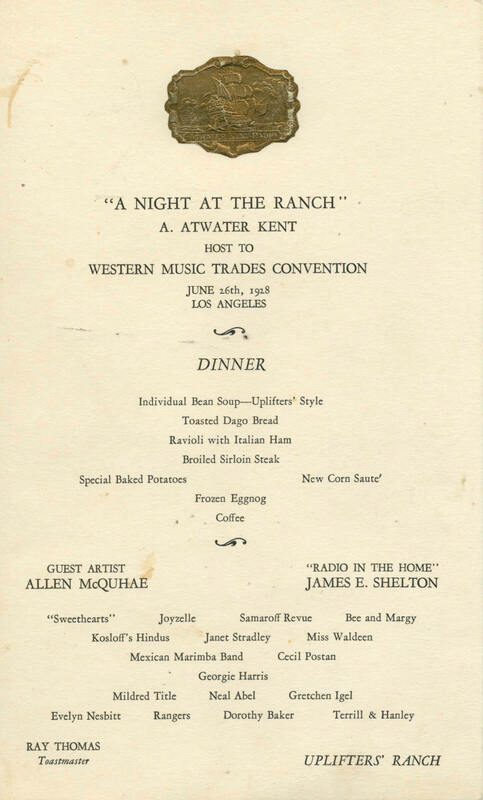 One of the first times NAMM presented a program outside of New York. 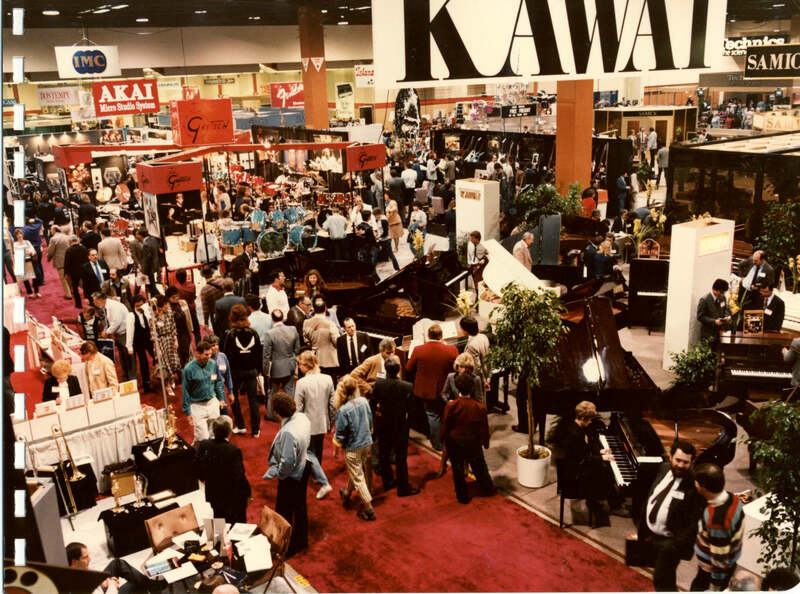 This year included the theme of radio, an important step in the development of the “music merchandise” aspect of the trade shows, allowing NAMM to focus on more than pianos. NAMM did not provide a trade show as a result of the Great Depression. The NAMM show returned thanks to President Parham Werlein. The show was held at the Stevens Hotel in Chicago. NAMM again did not provide a trade show, as a result of the Great Depression. NAMM continued to provide support to dealers to become active with community music making programs, such as lessons and civic events. 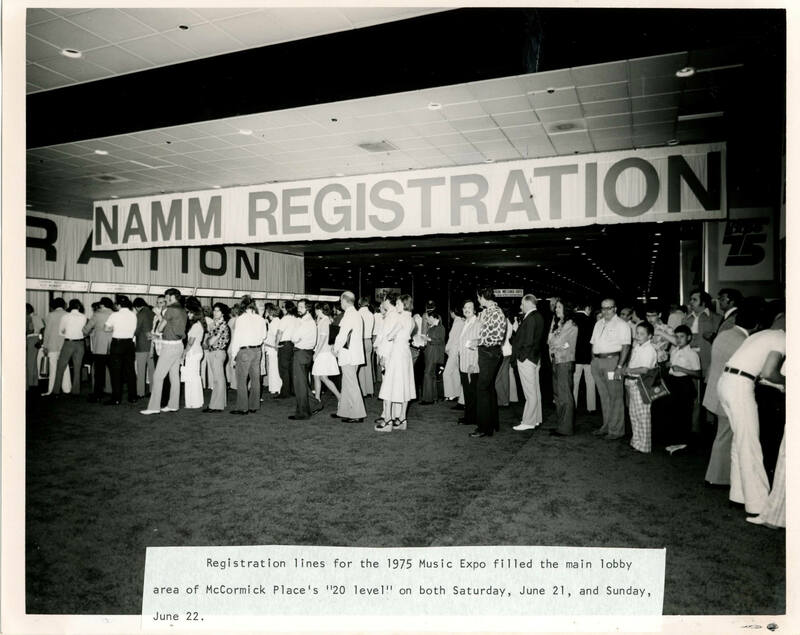 NAMM had 154 paid members. NAMM joined the efforts to promote National Music Week. Additionally, new rules state all those attending the NAMM Show must have a badge. 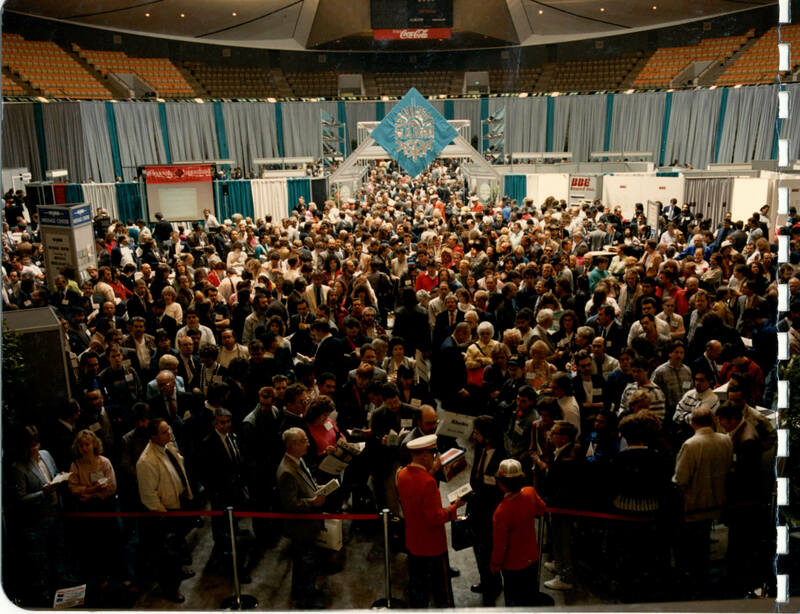 Membership numbers reach 248 while an estimated 2,800 people attended the show. This was also the year that the first annual window display contest was held at the show. Members of the NAMM board wrote the president of Montgomery Ward calling his attention to the very unfair comparison of the prices in the MW catalogue with those charged by music dealers. An early NAMM logo in the 1940s focused on a music education campaign. Hopes of holding a show were cut down by an order from James M. Byrnes, United States Secretary of State, who ordered a ban of all unnecessary travel. The NAMM Show returns for the first time after World War II and is held at the Palmer House in Chicago. The NAMM headquarters moves to 28 East Jackson Blvd in Chicago. Cost rose for exhibiters, from 52 cents to $1.60 per square foot. According to the Board report that year, the National average of convention space that year was $2.25 per square foot. NAMM marks its 50th anniversary! The trade show was held at the Palmer House in Chicago. An educational division of NAMM was created as a service to the membership department. The National Association of Young Music Merchants (NAYMM) is formed. NAMM awards The Rudolph Wurlitzer Company with a centennial plaque, thought to be the first NAMM Milestone Award. 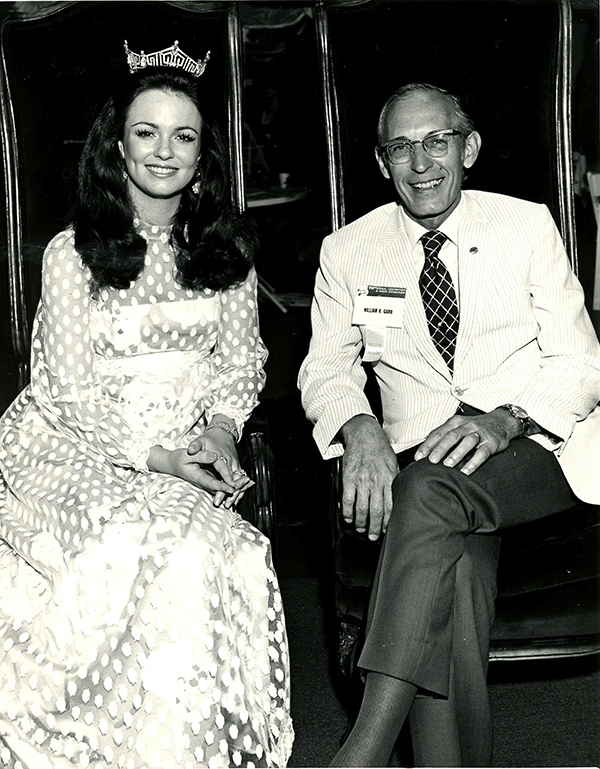 The “Miss Music Contest” was initiated for the purpose of heightening dealer interest in the convention. Last NAMM Show at the Hotel New Yorker. Awareness of NAMM grows thanks to the power of television. First film underwritten by NAMM for AMC, “Bringing Music into the Classroom” was released. NAMM membership hits 1,000 for the first time. NAMM members received booklets produced by the American Retail Federation on the subject of riot survival and insurance, as a result of civil rights unrest. NAMM held it first "open convention" in Miami Beach, Florida. The NAMM Show was held in the newly rebuilt McCormick Place in Chicago. Special guest was Phyllis George, Miss America (from Texas). 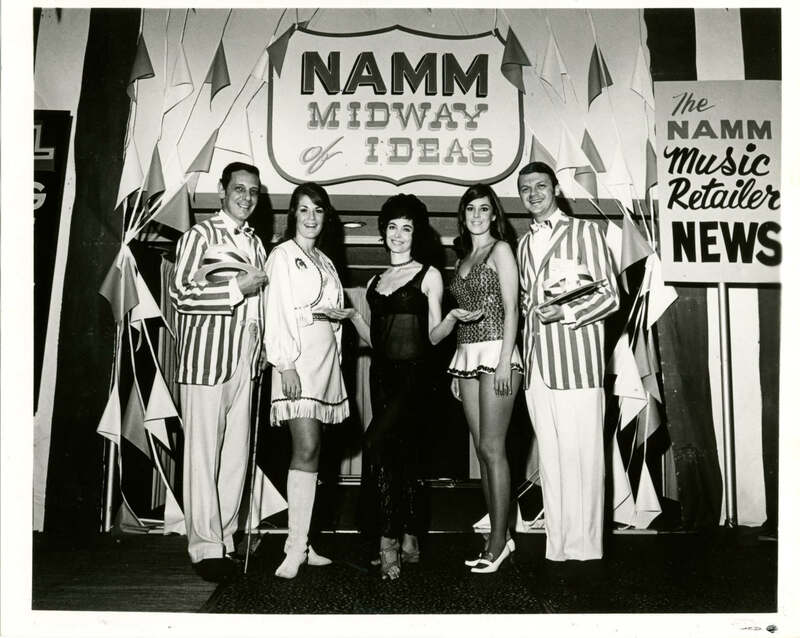 The 1971 NAMM Show and the Midway of Ideas provides the foundation for today’s NAMM U.
NAMM Past President Robert McDowell leads the efforts to promote “Discover Music” for music stores to promote within their communities. Registration lines for the 1975 Music Expo filled the main lobby area of McCormick’s Place in Chicago, IL. Special 75th Anniversary party was held during the annual trade show in Chicago, where a record 103,360 square feet was sold. Exhibits and Registration entrance of the winter Music & Sound Market at the Disneyland Convention Complex in Anaheim, California. First NAMM Show in St. Louis, MO. MIDI is introduced at the NAMM Show. NAMM’s headquarters moved to Carlsbad, CA from Chicago. 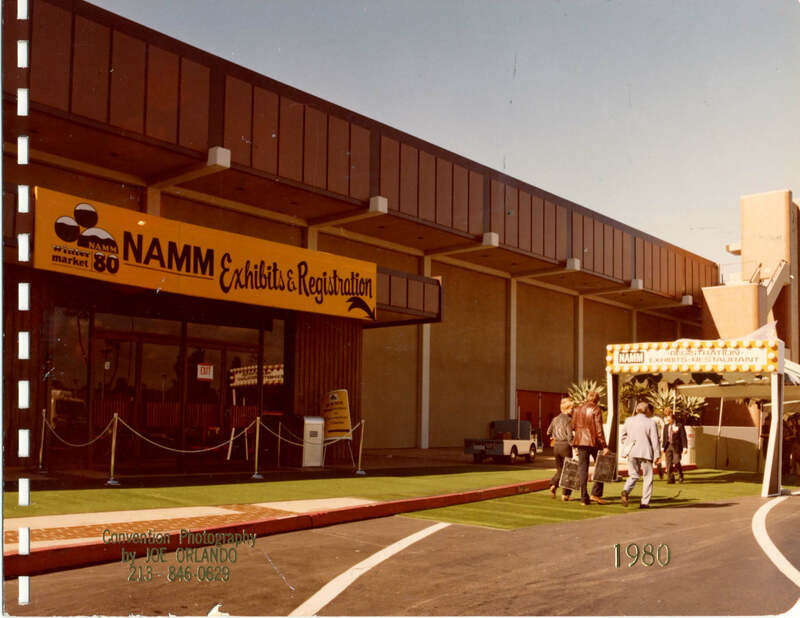 The 1985 NAMM Show brought the top brands together as the show continued to build momentum. Eager attendees gather in the Arena of the Anaheim Convention Center anxious for the show to open. NAMM teams up with Gordon Shaw to document brain research related to music making. First Nashville Summer NAMM Show. NAMM University and the NAMM magazine Playback are created. NAMM establishes the International Foundation for Music Research (IFMR). 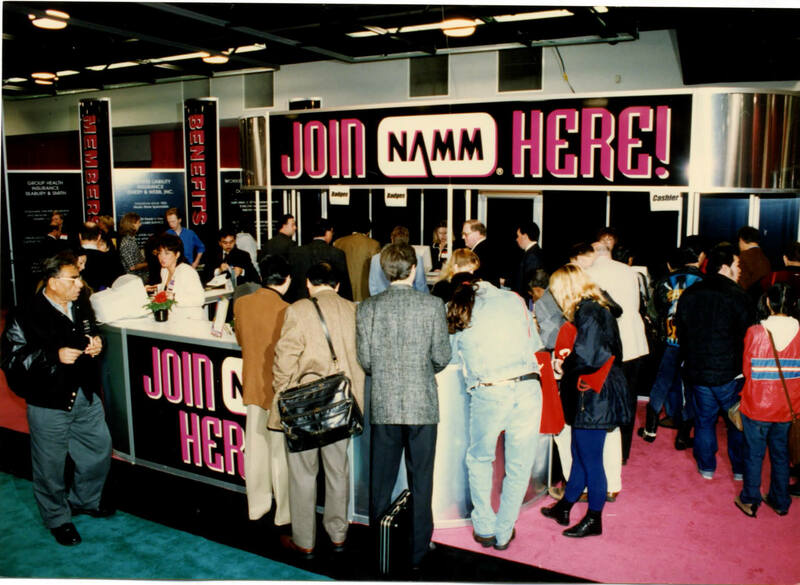 The 1997 show offered a “Join NAMM” area for prospects to register and current members to renew. NAMM Show moves to Los Angeles while Anaheim Convention Center is renovated. NAMM Show returns to Anaheim. The Museum of Making Music opens to the public. NAMM supports Piano 300 exhibition at the Smithsonian. First NAMM Oral History interview is captured. NAMM launches its extremely successful Best Communities for Music Education program, a national recognition program that has highlighted the outstanding efforts by teachers, administrators, parents, students and community leaders who support of their local school music programs. Launch of the NAMM U Breakfast sessions and the NAMM Idea Center sessions. The NAMM Foundation is officially established / incorporated. The NAMM Foundation formally invites College Students and Faculty to the NAMM Show via the “Generation Next” program. First TEC Awards at the NAMM Show. NAMM introduces Retail Boot Camp. The NAMM Foundation’s SupportMusic Coalition celebrates 10 years of grassroots advocacy effort. Record-setting NAMM U Breakfast Session with Steve Wozniak, co-founder of Apple. NAMM hits 10,000 members for the first time. NAMM has the highest International member companies in its history. (29%) of NAMM membership is from outside the U.S.
NAMM attendance in Anaheim tops 100,000 for the first time. 10th anniversary celebration of “Breakfast of Champions” with session featuring Graham Nash, St. Vincent and a performance and interview with Jake Shimabukuro. The NAMM Foundation celebrates 10 years of Music Education Days at the NAMM Show – an element that has enabled thousands of Music Educators to experience our world-famous trade shows.